Mobile apps are here to stay and paving the way that you quickly do business, helping to make your day-to-day life more productive and organized. Why not use our TRU Salon + Spa mobile app to help you with your salon needs? No matter what time of day it is, or where you are at, you can open our app and make your next appointment directly with our in-house calendar and your favorite stylist. Having to remember to call the salon during business hours to make your appointment is a thing of the past. Now you can do it any time of day that’s convenient for you. It’s easy to get so busy in our day-to-day lives that we forget something on our social calendar. We’ll send you an appointment reminder through our mobile app so that you don’t miss your salon time. At TRU salon + spa we believe in giving back. With every visit you’ll receive points in our Guest Rewards program as well as referrals, product purchases, and more. Use them as cash toward future hair and skincare product purchases or from our boutique. Monitor these points right on the app! When we put on special promotions, deals, events, and offers, we can send you a push notification to let you know how to take advantage of our great events and offers. This is a great way to never miss stocking up on your favorite styling products or take advantage of some much-needed pampering. 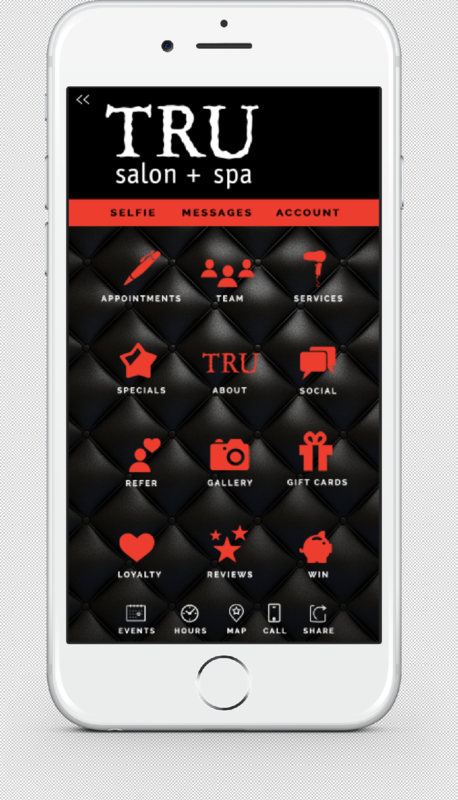 If you haven’t yet taken advantage of our Tru Salon+Spa mobile app, what are you waiting for? We believe in not only making your hair, and skin more beautiful .... but your day-to-day easier with our mobile app. You can download the app for free from iTunes, Google Play, or Amazon. Have questions for our team at TRU Salon + Spa? Give us a call at one of our two locations - Branchburg, NJ (908) 218-9878 or Warren, NJ (908) 753-9878, book online.